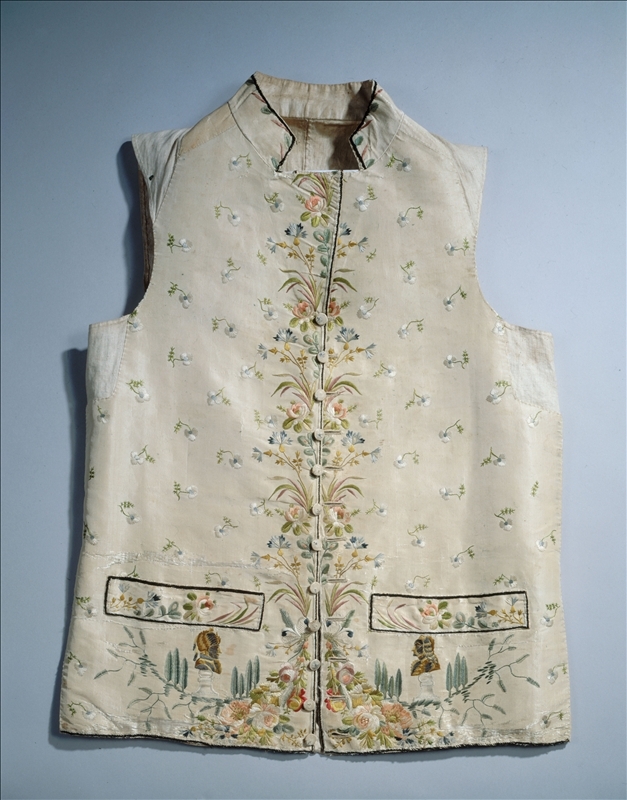 The straight shape of this waistcoat, together with its low collar and slit pockets, dates it to the period 1790–1795. The ornamentation confirms this. The philosophers François-Marie Arouet, known as Voltaire (1694–1778) and Jean–Jacques Rousseau (1712-1778) both died in the same year, but it was not until 1794 that Rousseau's ashes were brought from Ermenonville, where he died, and installed with great pomp and ceremony in the Pantheon, opposite Voltaire's tomb. 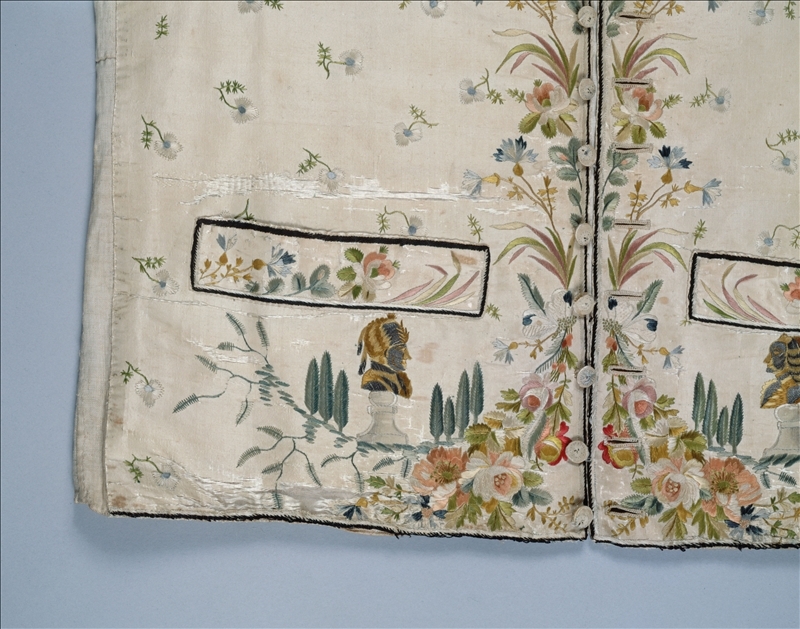 As this waistcoat relates, the two enemies were brought together for eternity by the Revolution. 18th-century waistcoats were sometimes given the appealing task of conjuring up political, social and artistic events, as well as such current trends as the taste for the exotic, travel and lovers' discourses. Their designers had to have engravings ready to hand in their workshops so as to meet demands promptly. 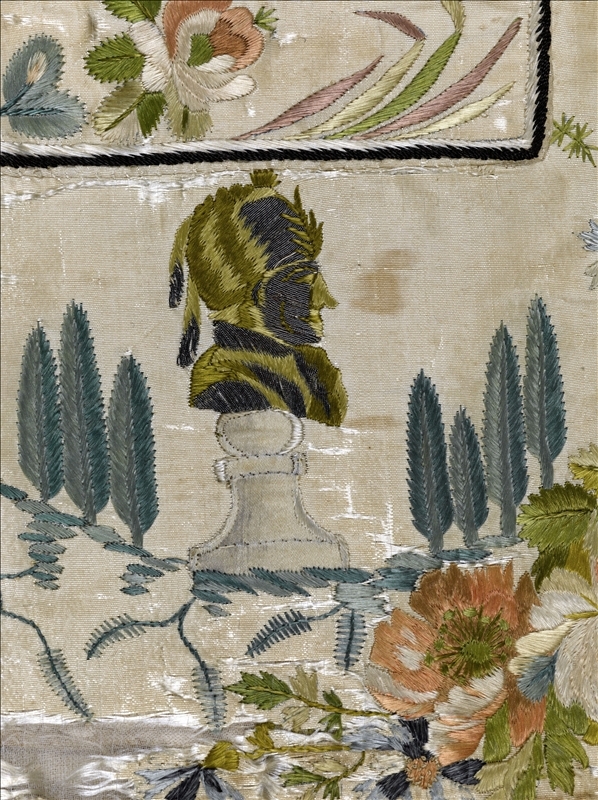 Here the embroidered bust of Rousseau takes its inspiration from an engraving by the artist Claude-Henri Watelet (1718–1786). The earnestness of this evocation of two great French intellectuals is tempered by the exoticism of the flat satin stitch, much appreciated in China.